"Old Fashioned Southern Cookin' - Perfect Desert for covered dish dinners." Place the peaches in a medium bowl. Sprinkle lemon juice over them. Mix together 1/2 cup of sugar and cornstarch. Sprinkle over the peaches, and stir to coat. Spoon into a 2 to 2 1/2 quart casserole dish. In a medium bowl, stir together the flour, 2 tablespoons of sugar, baking powder and salt. Cut in butter with a fork or pastry cutter until it is in fine crumbs. Make a well in the center, and pour in the cream. Stir with a fork until the dough pulls away from the sides of the bowl. Roll out dough on a floured surface until it is just big enough to cover the baking dish. Cut a 2 inch cross in the center. 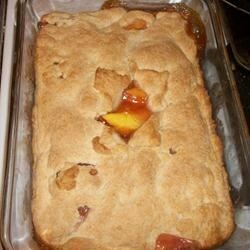 Place over the peaches, and tuck in the dough around the sides. Turn back the corners of the cross to reveal the filling. Bake for 40 to 45 minutes in the preheated oven, until filling is bubbly, and top is golden brown. Chef John shows you how to make a wonderfully crisp fruit cobbler! Crust came out all wrong. It was more like a very dense cobbler. I was thinking I'd get a pie crust like topping, I may alter this until I get that. Good if you're in a hurry though. My mom makes this for me on my birthdays. SHe uses a can of peaches and milk instead of cream and substitutes part of the milk for the juice in the peach can. its sooo good. This recipe was very good. My children loved it! I used frozen peaches. Thank you for the recipe!